16 November 2013 – Auckland’s first pre-Christmas event. 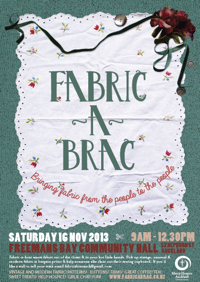 November is definitely turning out to be a Fabric-A-Vember with Auckland taking a turn to hold a Fabric-A-Brac event on 16th November, following Wellington’s event on 9th November. To book a stall, email fabricabracauck@gmail.com . This first pre-Christmas Fabric-A-Brac event promises to delight with plenty of modern and vintage fabric and haberdashery on offer as well as cuppas and delectable treats from Mercy Hospice. Proceeds to go towards the charity’s work with patients and families requiring end-of-life care and support.